What would $22 buy thrifting on a Saturday morning? Old Jar Grabber or Holder. I think this is an old garlic press? A cool old measuring jar with wooden handle. I love old kitchen utensils. Why? They are so versatile! Here are just a few of my past posts featuring vintage utensils. Kitchen utensils are perfect as farmhouse kitchen decor. Kitchen utensils as a photo display. Kitchen utensils make great Christmas ornaments. Kitchen utensils are perfect in the garden too! Here is my kitchen fairy garden from 2013. New ideas will be coming soon from today's utensil purchase! I loved your cookie cutter decoration when you first posted it. Lovely to see it again. Great thrifts this week. Love, love, love your vintage utensils!!! Very creative on your repurposing! Very fun finds...love that measuring cup! Carlene ... you are always so creative with displaying your kitchen gadgets. 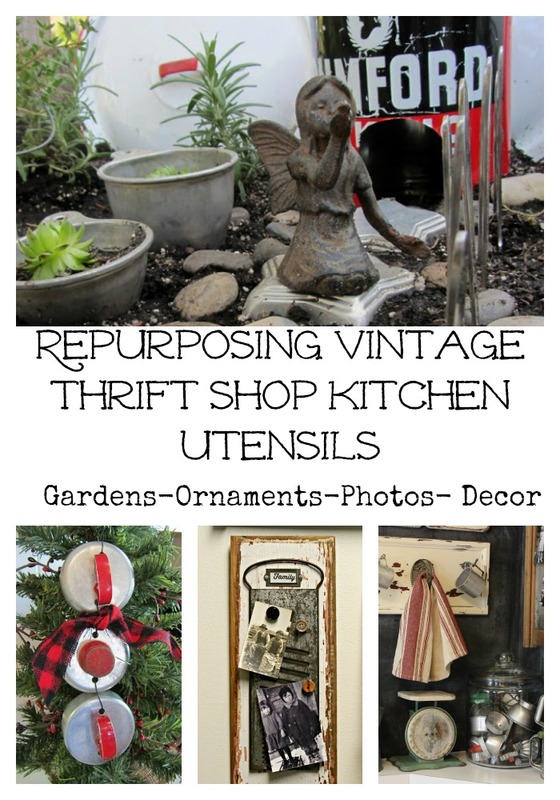 I am sure you have some fun stuff planned for the newly thrifted ones. I could add the masher to my collection and I love the old garlic press if that is what it is. I love that measuring cup! In all of my prowling antique malls and estate sales, I've never seen one like it. enjoying your cute ideas here. not always time to comment but glad to get your email notifications.